The recipe testing continues with our little guy Leo and last week’s experiment were these Sweet Potato Lentil Tater Tots. Clearly, we love incorporating sweet potatoes into EVERYTHING. So introducing them to our baby early on was just the natural thing for a sweet-potato-lovin’-mama to do. 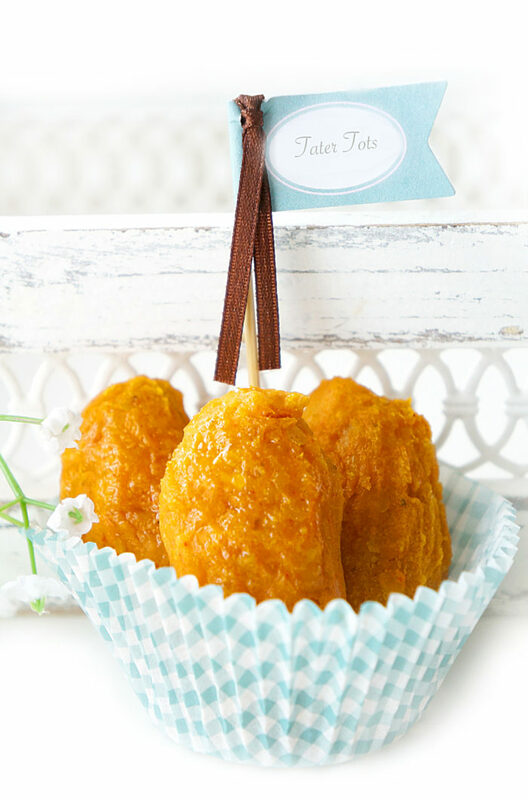 Plus, the texture is perfect for little ones who might not yet have any teeth, like our little guy. And can you really go wrong with a vegetable that’s loaded with vitamin C, A, potassium and fibre?! Initially, I baked up some sweet potato fries for Leo (minus the addition of salt) and he chomped away on those for a few days (and by chomping, I mean he consumed half and threw the rest on the floor), but I wanted to incorporate some more variety and iron into his diet as well. That’s where these tater tots come into play. By simply combining the cooked sweet potato with some cooked lentils and throwing in a few spices, you end up with ONE tasty and healthy little bite. 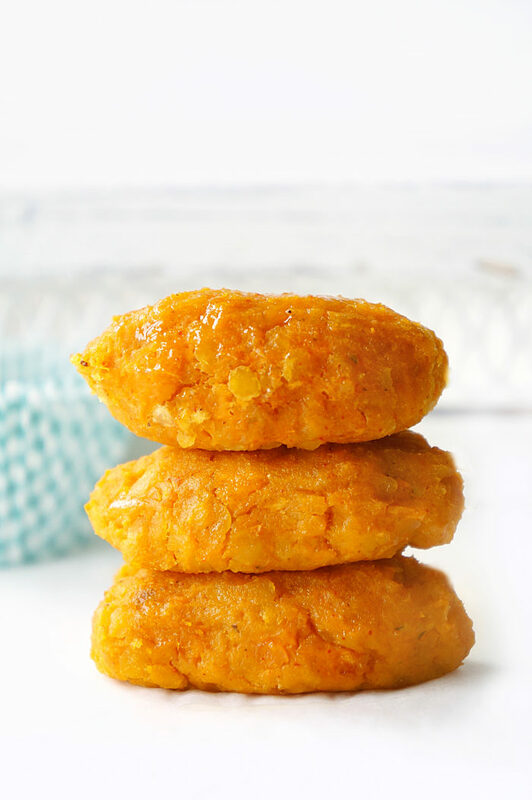 The sweet potato lentil combo is so perfect (especially for picky eaters) because you don’t even notice the lentils when they’re mashed together with the sweet potatoes, but they add that extra boost of protein, iron and fibre! As mentioned in my Mini Salmon Cakes post, there are different forms of iron — both animal and plant-based. Because lentils are plant-based, the iron is not quite as readily absorbed, but by pairing them with the sweet potato, which is a source of vitamin C, it helps to enhance the absorption of this mineral. That’s why these two foods together are a winning combination! 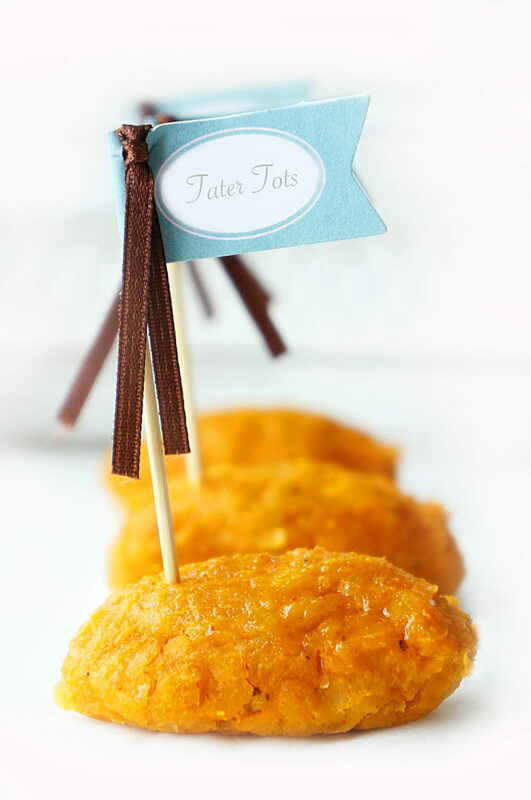 You may notice when you’re rolling the mixture into tater tots, the sweet potato mixture is pretty soft. Don’t worry — they will firm up as they’re cooking. The end result should be slightly firm and golden on the outside and soft and fluffy on the inside. For babies, I recommend leaving out the salt to limit sodium consumption, but for older children and adults, you can add a little bit of salt into the spice mixture if desired. I tried them with and without salt and thought they tasted good both times, but it’s totally up to you! 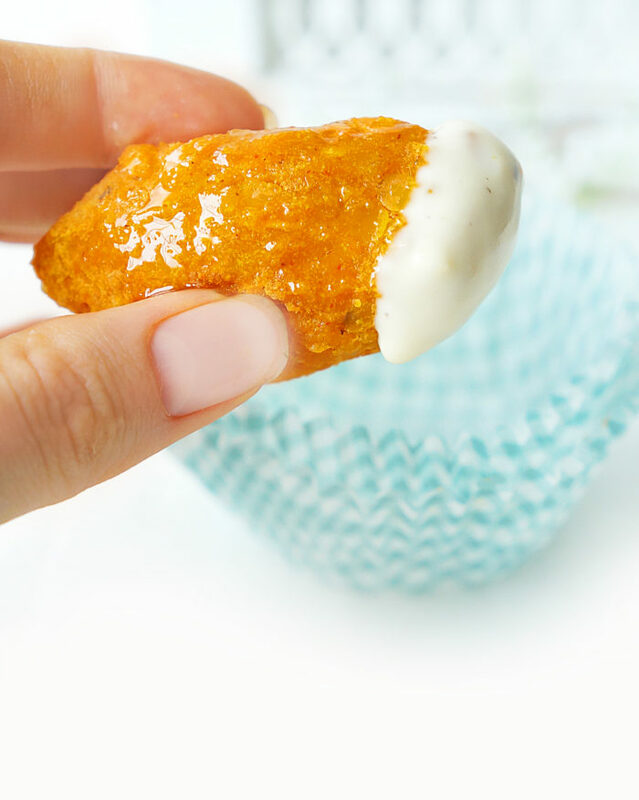 To prevent them from sticking to the pan, I suggest baking the tater tots on a parchment paper-lined baking sheet or a silicone baking sheet. I use these tools all the time and they can make the clean up process SO much easier. There’s enough cleaning up to do with kids in the house! There’s a number of ways to serve up these tater tots. Eat them either warm or cold and further increase the flavour (and fun!) by pairing them with a dip (I recommend this Roasted Garlic Dip). What kid (or adult) doesn’t love dip!? For adults, to add to the taste and presentation, you can sprinkle with some chopped parsley or cilantro! 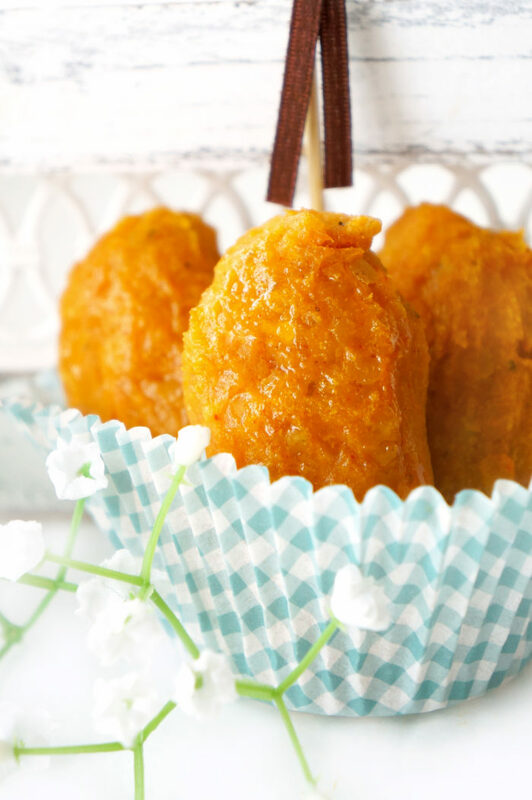 What’s your favourite way to incorporate sweet potatoes? 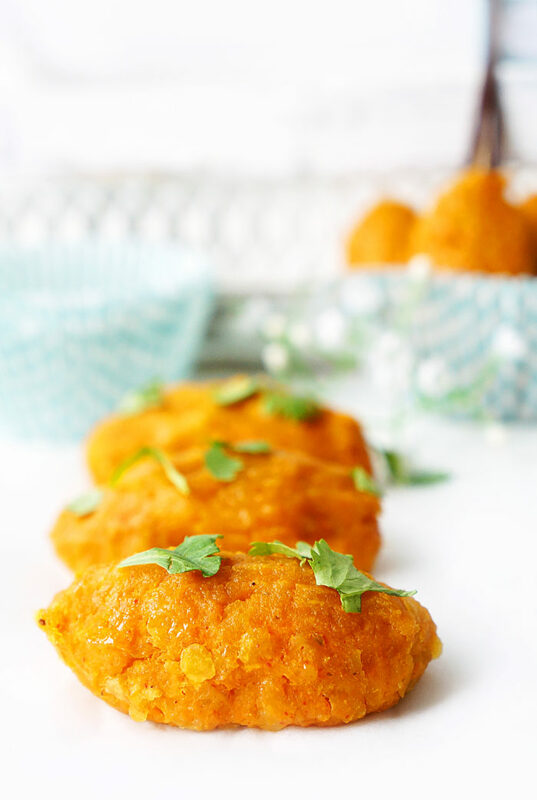 These sweet potato lentil tater tots are the perfect tasty nutrient-packed meal or snack for both little ones and adults! Eat them cold or hot, with dip or no dip. 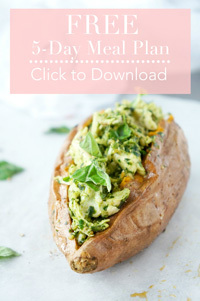 Also makes a great healthy lunch box option! Preheat oven to 400 degrees F. Pierce sweet potato with a fork and bake in oven for about 45-50 min. Alternatively you can microwave for approx 6-10 mins, until soft to touch. Remove skin from sweet potato and place in medium-sized bowl. Mash until smooth. Meanwhile, add the lentils to a saucepan, cover with the broth, bring to a boil and simmer until all liquid is almost absorbed (about 15-20 minutes). Turn off heat, cover with a lid and leave for 10 min. Add the cooked lentils to the bowl with the sweet potato, along with the paprika, onion powder, garlic powder and salt (optional) and combine mixture with hands or a spoon. Form mixture into small croquettes or patties (approx 18) and place on a baking tray lined with parchment paper or use a silicone baking mat. Spray or brush oil over the top of each tater tot. Bake in the oven at 400 degrees F for approximately 30 minutes, or until firm and lightly golden. * For babies, I recommend leaving out the salt to limit sodium consumption, but for older children and adults, you can add a little bit of salt into the spice mixture, if desired. Looking for some other great starter foods for babies? Check out some ideas below! Does it make a difference in flavor if you make it in the microwave instead of the oven (the sweet potato)?? I am super excited to make these for my little guy, I think I am going to add some sauteed onions! You can definitely cook the sweet potato in the microwave instead of the oven. You just want it to be soft enough to combine with the lentils and to form into the taters. Love the idea of adding sautéed onions! Hope your little guy enjoys them! Thanks for Sharing this awesome receipe ! I was wondering the temperature of the oven at the last step please? Hi Caroline, it’s my pleasure! For the last step, the oven should be at 400 degrees F. I apologize, I should’ve made that more clear. Hope that helps! Yes, they freeze really well! Usually I freeze about half the batch every time I make them and I’ve never had any issues. Hope you enjoy them! Can I use regular lentils instead of red split lentils? Thanks! I haven’t tried it, but I’m sure it would be okay! Hope it works out for you!